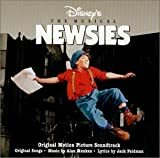 Accueil Bande originale Paroles Chansons King of New York – Paroles de la chanson dans “Newsies”. King of New York – Paroles de la chanson dans “Newsies”. Interprétée par Max Casella et les crieurs. A pair of new shoes with matching laces. A permanent box at sheep shed races. A Saturday night with the mayor’s daughter. I’m the king of New York. Nubbin’ with all the muckety-mucks. I’m blowin’ my dough and goin’ deluxe. A corduroy suit with fitted knickers. mezzanine seat to see the flickers. Havana cigars that cost a quarter. An editor’s desk for our star reporter. Making a headline out of a hunch. I’m/he’s the king of New York. I gotta be either dead or dreaming. ‘Cause look at that pape with my face beaming. Tomorrow they may wrap fishes in it. But I was a star for one whole minute. Flashpots are shooting bright as the sun. I’m one highfalutin’ sonuva gun. Now I’m king of New York.